“We’ll each take two bites and throw it away,” I said, trying to convince Marc and Doug that we had to try Burger King’s new bacon caramel sundae for scientific purposes and, of course, the readership. 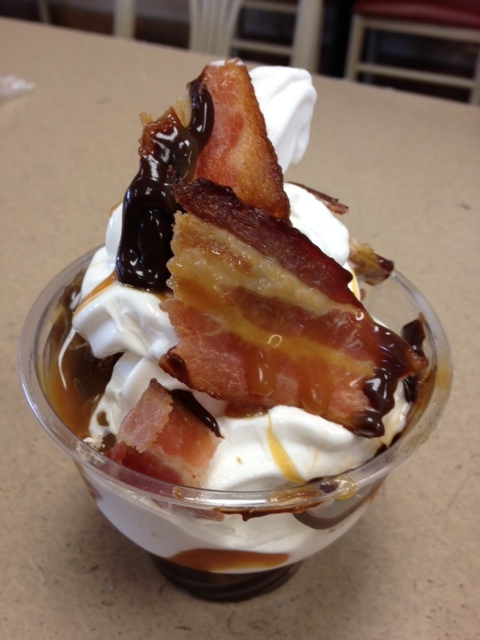 The construction is simple: chocolate sauce on the bottom, standard vanilla soft serve, small pieces of bacon sprinkled on top, caramel sauce and then 2 larger pieces of bacon to crown the concoction. I have to say I was pleasantly surprised – the bacon pieces were substantial, thick with a hint of smoke. The salty/sweet/cold combo made it a refreshing albeit shameful indulgence for a 95 degree day. Doug was the only one that showed any restraint, stopping after a taste; Marc and I polished the rest sundae off.